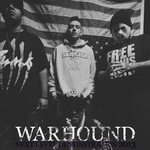 Check out new tunes by War Hound at their bandcamp. Next Level Demonstration 2013 is a showcase of two new songs, Truth and Next Level. And while you there, check out The Hardstyle, a compilation of band's previous work.